Ever-smaller endoscopic tools are improving the way surgeons will visualize tissue and perform operations without large incisions. Thanks to microendoscopic research and technology innovations, patients could be in for a new set of close-ups. Several groups of investigators are working to implement optical biopsies, in which the traditional methods will be replaced by an in situ microscopic examination. The result could be a better handle on disease while patient discomfort and risk are diminished. A look at various efforts shows what progress is being made. To the unaided eye, a working brain appears to do nothing. However, scientists know that there’s plenty going on at the cellular level. They just haven’t been able to tie this activity to what the brain is doing in awake, freely moving animals. A team from the University of Zurich in Switzerland and from the University of Washington in Seattle has reported in Optics Express thatadvances in technology may make this possible. The investigators constructed a microscope with millimeter dimensions that is capable of micron resolution and 25-fps two-photon imaging over a 200-μm-wide field of view. With the device, they successfully measured calcium signals in the brains of anesthetized rats. Figure 1. Shown are calcium signals in rat brains tracked with a millimeter-size microscope. Researchers imaged calcium signals in Purkinje cells in the cortex of sedated rats. In the top view, left, dendritic excitation is evident as bandlike calcium signals seen in three snapshots from a movie of 33-s total duration of relative fluorescence intensity changes. Reprinted with permission from Optics Express. “The ultimate goal is imaging awake animals and correlating neural activation patterns to specific behavior,” graduate student Christoph J. Engelbrecht said. There also are clinical applications for the microscope. It could be used, for example, in lieu of a biopsy to examine tissue. The investigators used gradient-index lenses and dichroic beamsplitting prisms from GrinTech of Jena, Germany, to construct a headpiece weighing only 0.6 g. They used hollow-core photonic crystal fibers from Crystal Fibre of Birkerød, Denmark, to deliver femtosecond 812-nm laser pulses from a Spectra-Physics Ti:sapphire system, achieving 30 to 40 percent transmission with minimal pulse distortion. They also employed a custom-developed resonant fiber scanner to move the excitation light in a spira pattern, creating a video image. This approach, Engelbrecht noted, provides a stable, inexpensive and relatively easy way to operate the beam-scanning mechanism. In their setup, the researchers directed the near-infrared pulses to the sample, collecting the resulting two-photon-excited fluorescence emission using a large-core fiber from Edmund Optics of Karlsruhe, Germany, and then imaged it with a Hamamatsu photomultiplier tube. Dichroic coatings reflected 93 percent of the near-IR excitation light while transmitting 95 percent of the fluorescence at 530 nm. Tests showed a spatial resolution of just under a micron laterally and about 7.7 μm axially. As a demonstration, the researchers measured dendritic calcium signals in Purkinje cells in the cerebellum of living but sedated rats. Their findings agreed with previous studies. Less really can be more, at least for colonoscopies. Many colon polyps that are removed are benign. Because clinicians can’t biopsy in place, however, they must extract polyps, exposing patients to some risk. Only later will it be known whether a given polyp was benign or precancerous. Confocal microendoscopy may change that, report researchers from the Mayo Clinic in Jacksonville, Fla. They presented preliminary findings on detecting colon neoplasia using microendoscopy during Digestive Disease Week in San Diego in May. Their results showed an ability to spot precancerous polyps with a sensitivity of 83 percent. The correct classification of benign polyps, or specificity, was 100 percent. The group used a confocal microendoscopy system from Paris-based Mauna Kea Technologies. The FDA-approved system consists of a flexible bundle of thousands of microscopic fibers that is passed through an endoscope. This bundle transmits the excitation light into the tissue and conveys the resulting signal back out to a scanner external to the patient. The system has an optical resolution both laterally and axially of better than 1 μm. The researchers used intravenous fluorescein as a contrast agent. They first looked at 10 benign lesions and 10 precancerous ones, along with 10 instances of normal colon tissue. Using confocal fluorescence microendoscopy, they found the crypt or surface shape of the cells to be the best predictor of neoplasia. They then looked at 37 additional polyps, which a pathologist examined also. Some 23 of the polyps were precancerous, while the others were benign. The confocal microendoscopic technique detected 19 of the 23 precancerous polyps. It correctly identified all of the benign polyps. More studies are under way to confirm these results, and an initial validation should be completed in a few months. Wallace noted that it may be possible to develop a computer-aided quantitative approach to differentiating neoplasia from benign tissue. In the meantime, the investigators are refining the current qualitative technique and are expanding the investigation. “We are also now studying Barrett’s esophagus, a precancerous condition of the esophagus,” he said. Another team has tackled the problem of detecting premalignant colon tissue, or dysplasia, using a Mauna Kea microendoscope and a dysplasia-binding peptide. The researchers — with members from Stanford University School of Medicine and from the Veterans Affairs Palo Alto Health Care System, both in California — attached fluorescein to a specific heptapeptide sequence, selecting one out of a library based on its binding to the contactin-associated protein target. Figure 2. Preferential binding of the targeted heptapeptide to precancerous mucosa (left) rather than to normal tissue (right), seen in vivo in the colon. Used in conjunction with microendoscopy, such agents could help screen for premalignant colon tissue without the need to remove any for a biopsy. Courtesy of Thomas D. Wang, University of Michigan. They used this fluorescent conjugate and microendoscopic imaging to visualize binding at the subcellular level. In the April 2008 issue of Nature Medicine, they reported that the heptapeptide bound more strongly to dysplastic tissue than to adjacent normal cells with 81 percent sensitivity and 82 percent specificity. The researchers now are developing the additional heptapeptides needed. They also are modifying the assessment process by first imaging over a wide area with fluorescence endoscopy and then inspecting troublesome sites using confocal microendoscopy. This is possible because the microendoscope passes through the instrument channel of a medical endoscope. Wang would like an instrument capable of imaging in two or three colors, with one preferably in the infrared. The ultimate goal, he explained, would be an imaging system that could guide tissue biopsy, that could help assess the risk of progression from precancer to full cancer and that could monitor treatment. The adage about observing something changing is true in more ways than one in the case of a miniaturized microsurgery probe built by a team with members from the University of Texas at Austin and from Stanford University. The researchers constructed a small two-axis microelectromechanical system (MEMS) mirror as part of a relay system that steered laser pulses for two-photon microscopy. Figure 3. 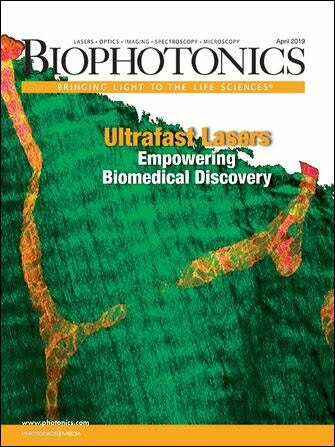 A probe uses ultrafast laser pulses at high energies to create cellular-level incisions for microsurgery and pulses at low energies for two-photon microscopy. The probe consists of an air-core photonic crystal fiber, a MEMS scanning mirror, a micro-optical imaging system and separate collection fiber. Because it both images and ablates, the device has the potential to identify and destroy diseased cells without harming the healthy surrounding tissue. Courtesy of Ben-Yakar Group, University of Texas at Austin. The investigators reported on its results at the CLEO conference in San Jose in May. The probe measured 14 × 10 × 40 mm, offered a 310-μm field of view and 1.64-μm lateral resolution. Axially, the resolution was 16.4 μm. By moving the MEMS mirror, the researchers scanned the two-photon excitation light across a sample and read the signal out at 10 fps. They performed two-photon imaging of pollen grains using a laser from Spectra-Physics for a light source and a Hamamatsu detector. They also imaged and carried out microsurgery of breast cancer cells, using laser intensities similar to those of tabletop systems. For this, they employed the fluorescent marker calcein AM, which labels only live cells. Finally, they demonstrated that the system works with gold nanorods, a two-photon contrast agent. As for the future, various improvements to the scanning system are planned. For example, spherical aberrations in the objective, a gradient-index lens, limited the resolution. Subsequent gradient-index lenses have had significantly reduced aberrations, but the researchers still are looking into other lens options. There also are plans to implement 3-D scanning and larger, metal-coated mirrors. These changes should decrease loss and allow lower magnification in the relay system lens pair, producing a larger field of view. Finally, there are plans to further miniaturize the scanner so that it can be used in a customized endoscope. “We estimate that we can shrink the current design down to 7 mm in diameter using the same general design with smaller optics and optimized packaging,” Ben-Yakar said. Fitting it into the accessory channel of a commercial endoscope would require that the diameter be less than 5 mm. That might demand custom micro-optics, but it could be possible. The goal, Ben-Yakar noted, is a small device suitable for a clinical seek-and-treat application. The worth of a picture in words says something about the amount of data in an image. That makes analyzing a lot of images a daunting task — a fact evident in a study undertaken at the University of Arizona in Tucson. Professor Arthur Gmitro’s group was collecting microendoscope images at 30 fps using a fluorescent contrast agent in an attempt to develop a screening tool for ovarian cancer. The idea, said radiology research assistant professor Andrew Rouse, is eventually to do an in-place optical biopsy using confocal microendoscopy. Figure 4. A close-up distinguishes cancer from normal tissue. Shown are representative confocal microendoscope images of the ovary. On top are normal (a) stroma and (b) epithelium, with (c) a close-up of image (b) showing the texture of normal epithelium. Below are images of (d-e) ovarian cancer, along with (f) a close-up of image (e) showing the texture of cancerous tissue. Software can detect the differences in tissue texture in such images and can automatically classify tissue as normal or not. It outperforms humans in categorizing tissue when working with such images. Reprinted with permission from the Journal of Biomedical Optics. That effort may be helped by computer-aided identification tools developed by Gmitro’s group. The team reported in the Journal of Biomedical Optics that an automatic classifier based on textural features derived from gray-level content did well in identifying cancer. After selecting the best algorithm and training it on a test set of images, the researchers compared its performance with that of people. Using a figure of merit related to sensitivity and specificity, the team found that four human observers achieved a value of about 0.85. In contrast, the algorithm hit values of better than 0.95 when examining the same images, thus outperforming people in identifying cancer. Rouse is confident that these algorithms can be implemented in real time. He added that work in the area continues, with validation of the technique under way with a larger data set. The researchers also are developing a technique for performing wide-area scans at the cellular level. This involves stitching together the individual images from a microendoscope video sequence. “Basically, as the catheter is moved on the surface of the tissue, the computer puts the frames together like a mosaic image,” Rouse explained. Lastly, a group from the Pasadena-based California Institute of Technology has reported on the narrowest-to-date forward-imaging optical coherence tomography (OCT) needle endoscope. The researchers used the 820-μm-diameter device for OCT inspection of the eye, distinguishing features such as remnant vitreous humor, retina and choroid in extracted porcine eyes. Figure 5. Shown is a swept-source optical coherence tomography setup with an 820-μm-diameter needle handheld probe, as applied during a vitrectomy — a surgical procedure for removal of vitreous humor. Reprinted with permission from the Journal of Biomedical Optics. They achieved results comparable to those from much larger instruments, which bodes well for use of the probe instead of traditional white-light illumination in a vitrectomy — a surgical procedure in which the vitreous humor is removed from the eye. The operation is a required precursor for retinal detachment surgery and for treatment of other severe eye conditions. OCT is well suited for this because it provides depth-resolved images without the use of a contrast agent. Figure 6. In these porcine retinal images acquired by an OCT probe, the retinal layer was partially detached during the removal of the vitreous humor, and some remnant vitreous humors on the retina were still visible (a-c). In (d), the retinal image from a commercial OCT microscope is shown. Reprinted with permission from the Journal of Biomedical Optics. The researchers constructed their small probe by exploiting a key technology, angle-cut gradient-index lenses from GrinTech. By rotating the 500-μm-diameter lenses at the same speed in opposite directions, they produced a planar sweep scan. They used a laser from Micron Optics of Atlanta for a 1310-nm source, selecting this over the typical 800 nm because of improved visibility. The longer wavelength also makes it easier to detect any vitreous humor remnant. The system’s axial resolution with the probe inserted was 7.8 μm, and the researchers observed structures up to 2.5 mm deep from the probe tip. Images captured with the probe compared favorably, the researchers reported in the Journal of Biomedical Optics, with those obtained with a commercial OCT system from Thorlabs of Newton, N.J. The group is working with eye surgeon Dr. Mark Humayun of the University of Southern California in Los Angeles to use the technology for retinal inspection during surgery. It also is working with STI Medical Systems of Honolulu to commercialize the system for gastrointestinal tract and endocervical canal applications. Caltech assistant professor of bioengineering and electrical engineering Changhuei Yang noted that the probe is a light pipe, which means that it can channel light out or in for imaging, ablation or photodynamic therapy. As for how narrow the probe could be, he said the limiting factor was the size of the gradient-index lenses. At 500 μm, current commercial offerings are not much above the smallest possible useful size. “There really is not that much of a clinical need for a needle probe that is narrower than 300 μm,” Yang said.